An international team of scientists led by researchers at the University of California, Davis used fossilized leaves and soil-formed minerals to construct a high-resolution record of atmospheric carbon dioxide levels for 16 million years of the late Palaeozoic Era (about 330 to 260 million years ago). Climate change not only impacts plants, but plants’ responses to the climate can in turn impact climate change, as well, amplifying its impacts and in many cases making those impacts more unpredictable, according to Isabel Montañez, the lead author of the Nature Geoscience study and a professor at UC Davis’ Department of Earth and Planetary Science. The authors say their study is one of the first to show that when plants change the way they function as CO2 rises or falls, it can have major impacts, even causing the extinction of some species. Over the past million years of Earth’s history, the level of atmospheric carbon dioxide has been generally low, fluctuating within a range of 200 to 300 parts-per-million (ppm). But this trend was abruptly interrupted by the rise of industrialization over the past 100 years, which led to the current level of 401 ppm — a level not seen on Earth in at least 3.5 million years. Scientists have long warned that higher concentrations of atmospheric CO2 will lead to global climate change, melting ice sheets, rising sea levels, and biodiversity loss — all of which, according to the authors of a new study published in the journal Nature Geoscience, were evident more than 300 million years, the only other period in our planet’s history when such high concentrations of CO2 in Earth’s atmosphere accompanied ice at the polar regions. An international team of scientists led by researchers at the University of California, Davis used fossilized leaves and soil-formed minerals to construct a high-resolution record of atmospheric carbon dioxide levels for 16 million years of the late Palaeozoic Era (about 330 to 260 million years ago). This was not only the last time ice covered Earth’s polar regions but also when large rainforests expanded throughout the tropics. The researchers found that the repeated restructuring of tropical forests that occurred all those millions of years ago played a considerable role in driving climate cycles that vacillated between cooler and warmer periods, which could portend the types of impacts we can expect the destruction of Earth’s rainforests today to have on the climate in years to come. Just as they do today, tropical forests stored massive amounts of carbon during the ancient glacial periods 300 million years ago. Montañez and team determined that repeated shifts in tropical forests in response to the changing climate account for the fluctuations between 100ppm and 300ppm atmospheric CO2 concentrations that are estimated to have taken place during the climate cycles of the period. Jenny McElwain, professor of paleobiology at University College in Dublin, Ireland and the co-lead author of the study, said the team’s results show that shifts in atmospheric CO2 levels impact different plant groups in distinct ways. 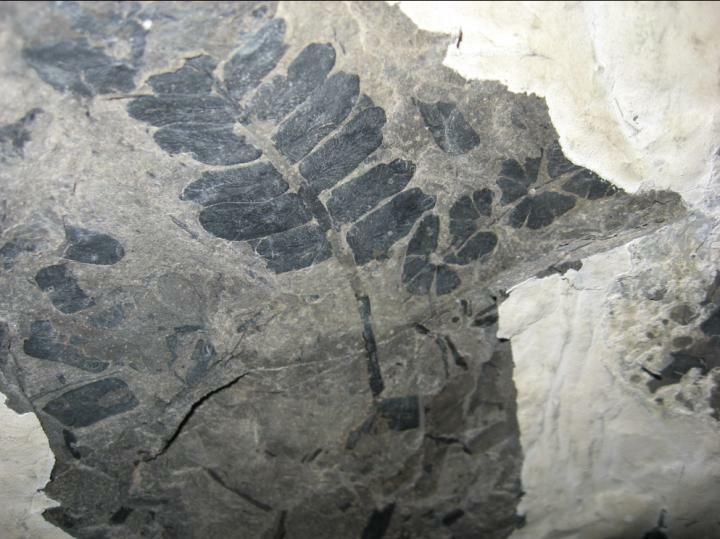 Scientists used fossilized plants, like this seed fern, to reconstruct the ancient atmospheric CO2 record from more than 300 million years ago. Photo Credit: William DiMichele/Smithsonian Institution.